As is the tradition, Tigey here. Merry Christmas all. 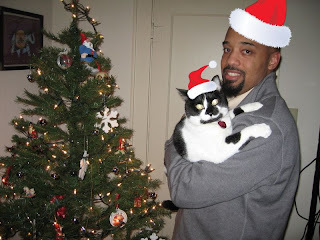 We don't have an official portrait for this year cos Beandad took the tree skirt away after I peed on it again. I don't know what it is about tree skirts, but they just make me want to pee. Do you feel the same way? I peed on last year's tree skirt too. Mia, of course, is all hugged up on Beandad for her picture. She just loves her Beandad like no other. Well, maybe like she loves Derby. 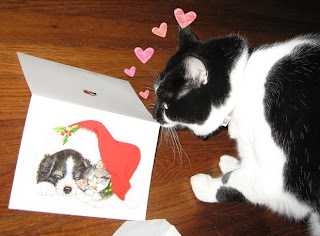 Here she is smelling some Derby smell off the Christmas card that her Sweetheart Cat sent her. Christmas wishes from our family to yours. Peace and love in the cat blogosphere. I just loves these kittehs! Purrs!! We love you too Maggie. Merry Christmas! Many purrs from owr howse to yurs. Schmaybe da tree makes yoo want to mark yur spot by peein on da skirt. We hafn't tried dat yet. Ut oh we got da evil eye from meowmom. Happy late birfday to yur Meowmie too! And a very merry meowy Christmas to all of you, and the beans, too! Merry Christmas! May you get lots of treats and toys! Merry Christmas! I hope you guys have a great day! Merry Christmas to you and your Beans. Our tree doesn't get a skirt either, but that is because I have to rip it up. Merry Christmas to my lovely Princess and all of her family. i got your card yesterday. ::sigh:: The Scent of a Princess. Tigey, all you can do is resolve to do better in the new year! 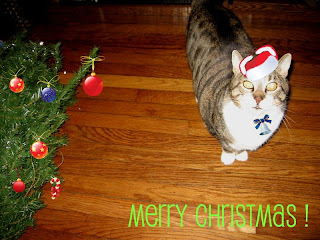 Merry holiday, kitties and beanparents! You know what I like even better than peeing on the tree skirt? Drinking the tree water! I hope you all have a meowy new year.